Phnom Penh Crown were the focus on Fabio Cannavaro's third day in the capital. 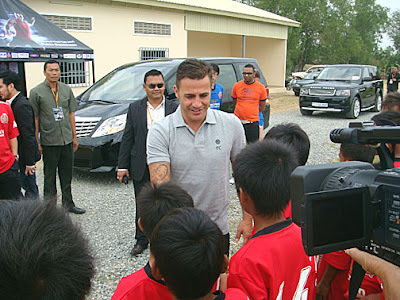 With the Crown president Rithy Samnang being the person who invited the ex-Italian World Cup-winning captain in the first place, it was only right and proper that he should show off his own youth football Academy, the only one in the country, to the world superstar. 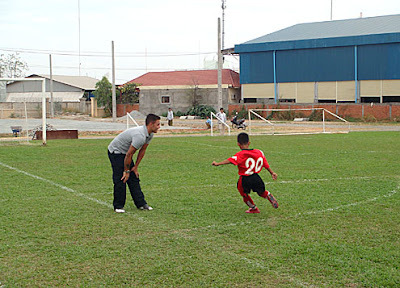 Fabio arrived on time at the club's Tuol Kork headquarters and quickly donned his football boots to join the U-13s on the pitch. He took part in shooting and ball control practice and then watched them at close quarters as they played a 20-minute match between themselves. He then took questions from the youngsters, the best in the country at their age group, and gave his answers in English. 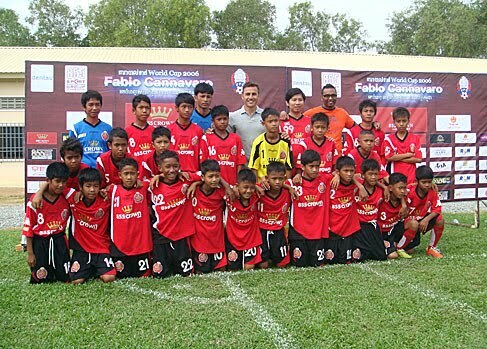 Both the Academy and the Crown first-team, who'd just completed their early morning training session under coach David Booth as Fabio arrived, posed for team group photos before Fabio once again, as he has everywhere, made sure he signed every autograph or picture that was requested of him. 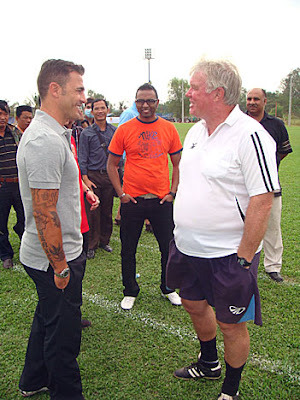 His willingness to oblige the football fans he's encountered has been a key feature of his visit. And his time spent at the PPCFC Academy will certainly be an inspiration to the Crown youngsters, who shared the spotlight with him this morning. Handing over a playing kit and footballs to the charity Friends International will be the last official tour event with Fabio due to leave early tomorrow morning.